The Citadis trams for Casablanca tramway were manufactured by Alstom. The last two Citadis trams leaving for Casablanca, from France. The Casablanca Citadis tram service was inaugurated in December 2012. Image courtesy of Magharebia. The Casablanca Tramway line is the biggest of its kind in Morocco when it comes to the stations covered and line length. The first line of Casablanca Tramway opened to the public in December 2012. The King of Morocco, His Majesty Mohammed VI, officially inaugurated the tram service. "The first line of Casablanca Tramway opened to the public in December 2012." The 31km tram line links the south-western and eastern suburbs of Casablanca to the centre of the city, covering 48 stations along the route. It has been built at a cost of MAD5.9 billion ($745m). The tram services are currently provided at frequencies of four minutes 45 seconds and eight minutes 30 seconds respectively during peak time and non-peak times. More lines are planned to be added in future. The Y-shaped Casablanca tram line one covers a number of areas including Casa Voyageurs, Central Train Station and the Main Square. The Casablanca Tramway has been built with the primary purpose of developing a fast and eco-friendly means of transport. The finance agreement pertaining to the tram project was signed by the Moroccan officials in October 2008. The new tramway has resolved the problem of inadequate public transport in Casablanca. It has also led to the lessening of traffic jams, and a drop in both sound and air pollution. More than 3,000 jobs were generated during the course of the project. The trams, lines and all related equipment were thoroughly tested prior to launch of services. The security officers, drivers and ticket inspectors were given training for approximately 1,850 hours. The project also included planting more than 4,000 trees along the 31km stretch. The Tangier-Casablanca high-speed rail line is under construction in Morocco. The 350km long line will link Morocco’s largest city, Casablanca, with Tangier. The Casablanca tramway project is a primary element of the Casablanca Urban Development Programme, which has resulted from an alliance between France and Morocco. The programme aims to enhance the living conditions of Casablanca, along with sustaining its potential as an economy. The urban development programme will initiate measures to enable the suburbs of Casablanca, such as Dar Bouazza and Lahraouiyne, to get integrated with the main urban zone. The programme will also develop a regional financial centre, as well as housing units in the region of Anfa-Aroport. All these locations will be subsequently connected by an efficient transportation system. A consortium known as Casa Tram was established by CDG (Caisse de Depot et Gestion), RATP (Paris Transit Authority) and Transinvest in 2009 to build the Casablanca tramway. The consortium is also responsible for the operation and maintenance of the tramway for five years. Casa Tram awarded the construction management contract for the tramway to a consortium of France-based Systra, and CID Engineering & Development Consultants of Morocco. The consortium handled issues pertaining to tendering, project design and supervision of construction. Two more contracts were awarded to Alstom in 2010 for designing, constructing and deploying the signalling and power supply systems on the tram line. Around 40 personnel are carrying out maintenance operations on the trams on a daily basis, during the operational phase. The traffic management of the tram line is being taken care of by the Central Command Post in Sidi Moumen. Casa Tram awarded a contract to Alstom for providing 74 Citadis train sets for the Casablanca tramway in 2009. The trams provide services to around 250,000 passengers per day. The Citadis trams of Casablanca tramway have been custom-built to facilitate free movement of passengers. Each tram can accommodate 606 passengers. The trams have been specifically manufactured to match with the architecture of Casablanca. The interiors are inclusive of colours and motifs conforming to the specific style of Morocco. "The trams have been specifically manufactured to match with the architecture of Casablanca." The presence of large tinted bay windows, air-conditioning and window aisles assure the passengers of comfortable ambience. The trams also have display systems providing information in Arabic and French. The tram service was inaugurated with 37 operating trams of 65m in length. 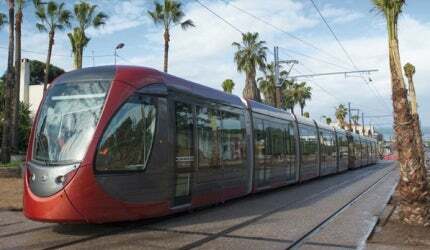 The Moroccan National Government contributed MAD1.2 billion ($135.7m) for the Casablanca tramway project. The remaining funds were mobilised through municipal budget and loans. A loan of $307m was also borrowed from France for purchasing the rolling stock.